Why Do We Need Bees and Other Pollinators? 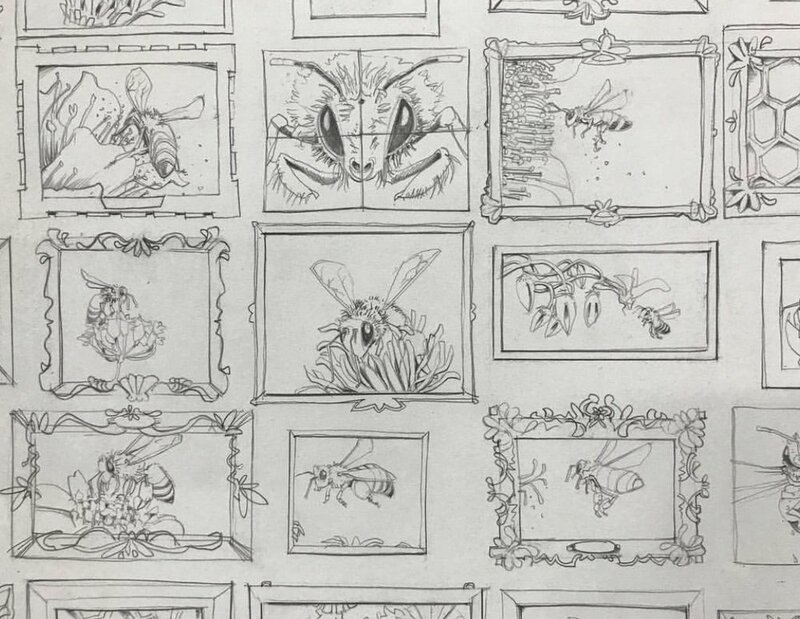 The following talented artists are also apiarists or apiculturists, if you will, who love bees and use them as symbolism in their work to call upon their rich archetypal history. e.g. In ancient Egyptian mythology, bees grew from the tears of the sun god Ra when they landed on the hot desert sand. In one of the thirty-three Homeric Hymns, Apollo received the gift of prophecy from the Thriae nymphs - a trinity of pre-Hellenic Aegean bee goddesses. Bees are documented in the ancient art and literature in nearly every ancient culture on the planet. Bees are the building blocks of human life on Earth. LUKE ROTHSCHILD is a brilliant painter, composer, and musician that lives and works in Venice, CA. Luke shows and sells his original paintings, composes music for film and television, and tours with his avant-garde tribrid ensemble String Theory led by Luke and his incredibly gifted wife Holly Terrell Rothschild and an array of talented dancers and musicians, who present original music, choreographed dance, and their signature hand-crafted architectural harp installations. This is Jasper (graphite on archival paper). KIM BARRY is a prolific artist and woman of note! 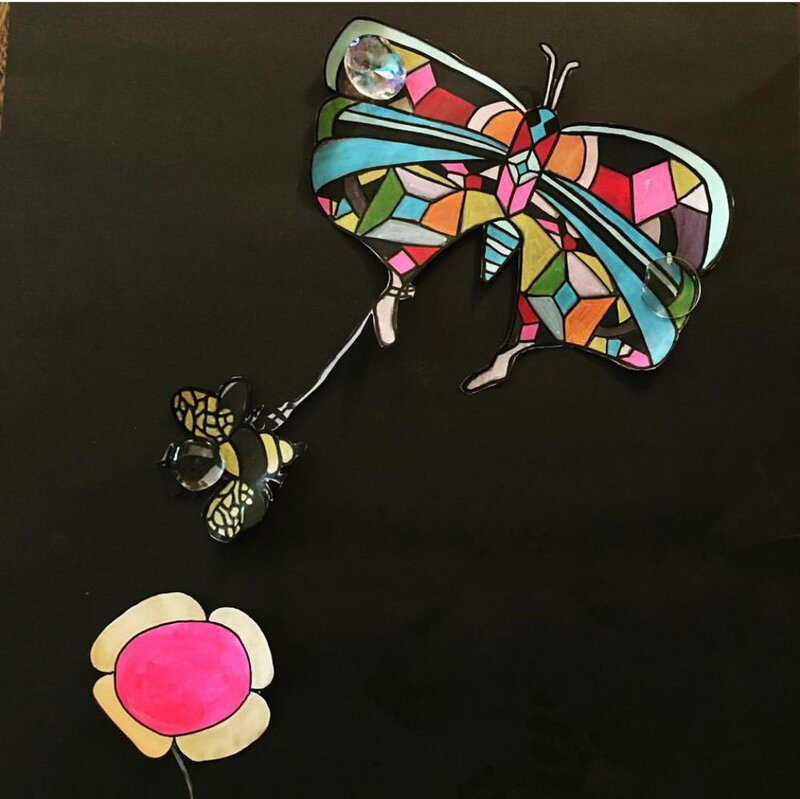 Working across mediums to explore different modes of creative expression, Kim, pollinates the art communities she builds across the nation. Born in Pittsburgh, PA. Graduate of Penn State University, Barry has created pop up studios -- Suite 106 in Florida, West Eleven in Los Angeles, and, most recently SixTHreeFouR in Pittsburgh, PA. The spaces create interactive environments that include paintings, sculptures, music, movement and installations as stories to connect myths of our inner worlds to the consistent symbolism held and expressed in the everyday words and movements of our seemingly disconnected modern outer world. Her work is held in private and corporate collections. Above: "Wild Kingdom" 2017 Acrylic on Canvas 36" x 72"
EDGAR FABIÁN FRIAS is a talented, prolific artist practicing in his native Southern California where he incorporates a variety of mediums, methods, and interventions, including happenings and rituals to help fight for environmental issues caused by irresponsible corporations effecting Los Angeles County, which are similar issues facing communities world-wide. Expose one harmful practice and the effect ripples. Edgar staged a series of performative rituals that was part of the Getty's Pacific Standard Time: LA/LA project (which overall generated $430 million to Los Angeles' cultural economy, people listen up, the arts are big business and the arts change perspectives, which change lives). Above, Edgar performs "Give US Home Spider" - a series of ritual performances reenacting the Wixarika’s sacred journey to Wirikuta, superimposed on top of channels that distribute goods which arrive in the Port of Los Angeles and move through predominately Latino communities of Los Angeles, the Inland Empire and Coachella Valley. The documentation of the performative the rituals were presented at Angels Gate Cultural Center in San Pedro overlooking the Port of Los Angeles, harkening back to Baja California's rife history of migration, trade, and social injustice, which first affected the Native Americans. Now, the only thing to do is create sociocultural healing through the arts. SHARON ALLICOTTI is an esteemed artist who lives and works in Los Angeles. After retiring from launching the Laguna College of Art & Design's MFA program, she works in her studio nonstop while also mentoring grad students to pass on the guardianship her teacher's passed on to her through carrying on the endless continuum of the contemporary canon of art. JEFF PETERS is a prolific Los Angeles-based artist who is represented by Hall Spassov in Bellevue, Washington. Peters lives and works in Downtown Los Angeles. This work and a vast array of other paintings may be viewed and purchased by contacting his gallery via the link below. MOUTY SHACKELFORD is a mixed-media artist using what she refers to as “Melted Layers” - the combination of acrylic, resins, and focused heat requiring intense control and exact pigmentation placement, not dissimilar to the process required for decorative glass blowing. Mouty is dedicated to her art practice, working with focus to present work that is ever-changing, ever-expanding, and constantly pushing the limits of painting to create three-dimensional works of art on the canvas. Above: "PollenNation" 2018, acrylic thread, resin, and gold hexagon. The work will be featured in an exhibition at the Botanical Research Institute of Texas in Summer 2018. She this work and other works available for purchase on Mouty's website. DIANA GARCIA is a prolific multi-media artist, filmmaker, sculpture, and illustrator who lives and works in both Mexico City and New Orleans, LA. Her illustrious drawings that she refers to as "Guardians" can be found in cities throughout the world. Her work is in public art installations and in worldwide private and public collections. Please see her website below to explore the wide range of her oeuvre and inventive imagination that she brings to life to inspire all through her prolific work. JULIE LING is a brilliant artist based in Los Angeles whose work bridges mediums to share her imaginative oeuvre through celebrating life, love, nature and all things bright and beautiful in a time when the world is quite dark and at odds with itself. You'll see her public art installations throughout Los Angeles and do explore her unique body of work on her artist website below. 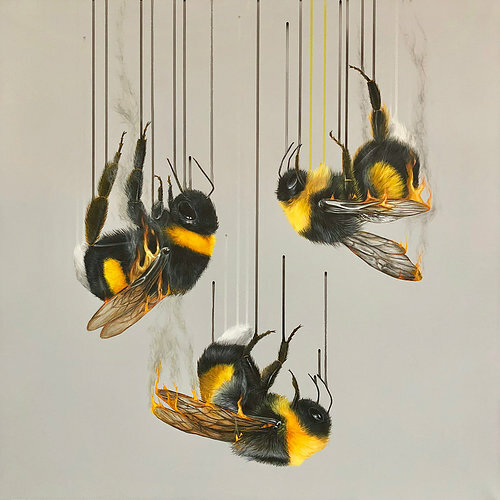 Louise McNaught is an international fine artist based in London who has dedicated her practice to that of animals and the natural world. “When focusing on endangered species the imagery often takes on a duality of not only what is happening to the animal itself, but also reflects how we feel psychologically about the effect the human race is having on these species." Kiel Johnson is a celebrated artist who works in a range of mediums from drawing to sculpture. This image is from Kiel’s “Honey Bee Hall of Fame” series.